Julie is a freelance writer and the author of Elizabeth Ann Seton: Saint for a New Nation (Paulist Press, 2001) and God Is Like…Three Parables for Children (Waterbrook Press, 2000). She has written for Our Daily Visitor and also authored a preschool catechism manual based on Montessori principles. Julie and her husband, Clem, have four children and eleven grandchildren. They live in South Bend, Indiana. 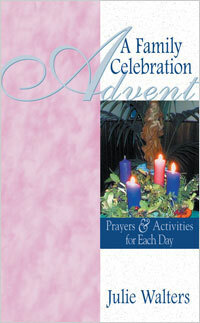 Enjoy the wealth of Advent traditions, such as the Advent wreath and the Jesse tree, while sharing Scripture, meditations, reflections and prayer with family members of all ages.